This report presents water-quality data from two nationwide studies on the occurrence and distribution of organic wastewater contaminants. These data are part of the continuing effort of the U.S. Geological Survey Toxic Substances Hydrology Program to collect baseline information on the environmental occurrence of pharmaceuticals and other organic wastewater contaminants. In 2000, samples were collected from 47 ambient ground-water sites (not drinking-water wells) in 18 states and analyzed for 65 organic wastewater contaminants. In the summer of 2001, samples were collected from 74 sources of raw, untreated, drinking water in 25 states and Puerto Rico and analyzed for 100 organic wastewater contaminants. These sources comprise 25 ground-water and 49 surface-water sources of drinking water serving populations ranging from one family to more than 8 million people. Site selection for both studies focused on areas known or suspected to contain sources of animal and/or human wastewater. The five most frequently detected compounds in samples collected from ambient ground-water sites are N,N-diethyltoluamide (35 percent, insect repellant), bisphenol A (30 percent, plastic- and epoxy-manufacturing ingredient), tri(2-chloroethy) phosphate (30 percent, fire retardant), sulfamethoxazole (23 percent, veterinary and human antibiotic), and 4-octylphenol monoethoxylate (19 percent, detergent metabolite). The five most frequently detected organic wastewater contaminants in samples of untreated drinking water from surface-water sources are cholesterol (59 percent, natural sterol), metolachlor (53 percent, herbicide), cotinine (51 percent, nicotine metabolite), Β -sitosterol (37 percent, natural plant sterol), and 1,7-dimethylxanthine (27 percent, caffeine metabolite). The five most frequently detected organic wastewater contaminants in samples of untreated drinking water from ground-water sources are tetrachloroethylene (24 percent, solvent), carbamazepine (20 percent, pharmaceutical), bisphenol A (20 percent, plastic- and epoxy-manufacturing ingredient), 1,7-dimethylxanthine (16 percent, caffeine metabolite), and tri(2-chloroethyl) phosphate (12 percent, fire retardant). 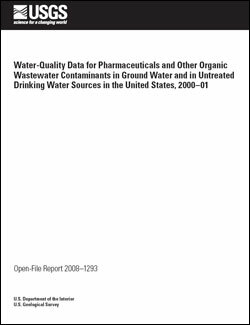 Barnes, K.K., Kolpin, D.W., Focazio, M.J., Furlong, E.T., Meyer, M.T., Zaugg, S.D., Haack, S.K., Barber, L.B., and Thurman, E.M., 2008, Water-quality data for pharmaceuticals and other organic wastewater contaminants in ground water and in untreated drinking water sources in the United States, 2000–01: U.S. Geological Survey Open-File Report 2008–1293, 7 p. plus tables.